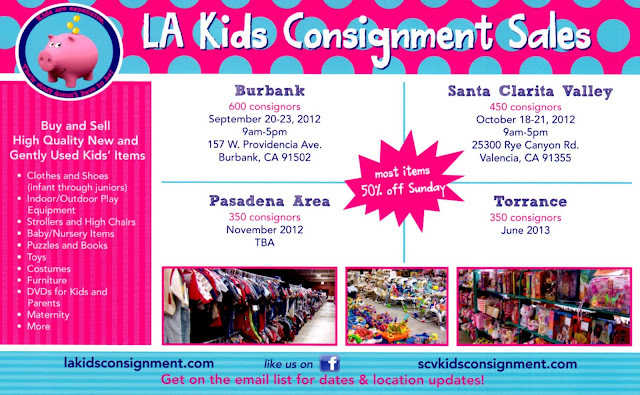 I've never participated in a consignment sale but my friend, Yvonne, buys and sells at this sale. She said that the sellers set the prices and the last day of the sale, many sellers mark their items for half price. Yesterday Yvonne bought a really great bed for her daughter that came with an attached bookshelf, bed frame, and mattress for only $110. If you can make your way over to Burbank this weekend, you can pick up a Halloween costume, clothes for babies through teens, toys, and more for your kids that will beat any price you can find in retail stores!